Editor’s note: A previous version of this commentary was published by Forbes. Free trade was a major boogeyman in the recent election. Donald Trump regularly claimed that “we don’t win on trade” and proposed dramatic increases in tariffs. Both Trump and Hillary Clinton opposed the Trans Pacific Partnership and each expressed skepticism of free trade agreements in general. Last year, the U.S. sold $1.5 trillion worth of goods abroad and imported $2.25 trillion from other countries. In effect, for every two items we exported, we imported three items. Since American workers produce exports but foreign workers produce imports, it is easy to give this boogeyman teeth. If America is truly losing on trade, it is not because of free trade deals, but because of their absence. But this raises an important question. Is our large trade imbalance a result of too many free trade agreements or a result of not having enough of them? Free trade agreements, by definition, help level the playing field. When they are not in place, countries often tilt that field against U.S. producers through tariffs and other barriers to trade. Let’s examine the facts. According to data from the U.S. Census Bureau, the 20 countries with which we have a pact purchased nearly half (47 percent) of all U.S. exports in 2015, and the U.S. ran a trade surplus with 14 of them. Furthermore, our trade with the 20 nations was relatively balanced in 2015 — $710 billion in exports and $774 billion in imports. In contrast, trade with the other 175 nations in the world was grossly unbalanced — $792 billion in exports compared to $1,472 billion in imports. Thus, a whopping 91 percent of our trade deficit takes place outside a free trade agreement. It comes instead from commerce that we do with countries such as China and Japan. Most importantly, history shows that our balance of trade with a nation tends to swing in our favor after we set up a free trade agreement. For example, in 2003, the year before the U.S.-Chile pact went into effect, the U.S. exported $4 billion to Chile and imported $5 billion from it. Last year, however, the U.S. exported $15 billion to Chile while importing $9 billion. 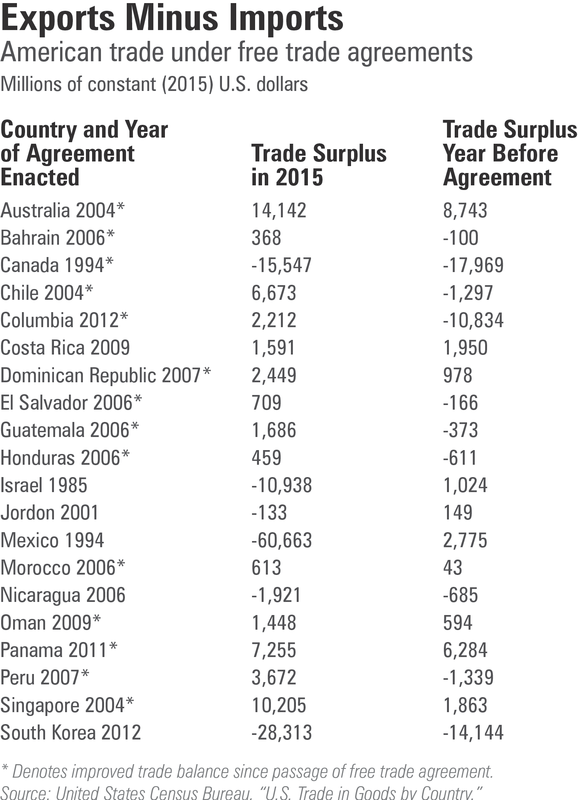 A small trade deficit, then, swung to a large surplus. And after signing an agreement with Australia in 2004, our exports to that nation have increased by $12 billion while our imports from it have risen by only $4 billion. Most other agreements have had similar results. To be sure, there are exceptions. Mexico is far and away the largest of these. While U.S.-Mexican trade was roughly balanced in 1993, today we have a $61 billion trade deficit with our neighbor to the south. Likewise, U.S. exports to South Korea have increased only marginally while imports have increased 26 percent. Still, the U.S. trade balance with another nation generally improves after a free trade agreement starts — 70 percent of the time. And this talk of trade balances does not even touch on the primary selling point of trade, financial gain. Far from being the zero-sum game of winners and losers, trade creates wealth by allowing nations to specialize in what they do best and obtain from others what they do worst. The real income of the median family in America is 29 percent higher today thanks to international trade’s effect of lowering prices. The gains from trade are best realized when it is free from artificial impediments, such as those that countries like China and Japan set up against us today. Our history with free trade agreements suggests that when American workers and businesses are allowed to compete on a level playing field, they succeed. 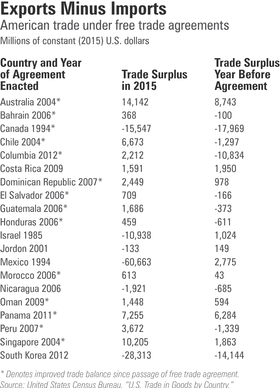 The data show that if America is truly losing on trade, it is not because of free trade deals, but because of their absence. The free trade boogeyman needs to be put back in the closet.